This is an automatic trading robot. The trading system is based on the power of buyers and sellers, it also uses filtering of false signals. It can be used with any brokers on any account types (ECN, Classic, NDD, STP). The Expert Advisor has flexible settings, every trader can decide how and where to use the EA. Works with 4 and 5-digit quotes. In order to use with 4-digit quotes, reduce all point values 10 times. The parameter signal - normal/revers. Normal means that the EA will enter in the market direction. Revers means that the EA will enter opposite to market direction. Trade direction - buy and sell, only buy, only sell. Maximum number of orders buy - maximum number of simultaneous buy orders. Maximum number of sell - maximum number of simultaneous sell orders. Number of bars involved in the signal - number of bars used for entry signal calculation. Risk profit - true/false. True means that the EA is allowed to trade in two directions if there is a signal. Mirrored if false. Max.spread - maximum allowed spread for trading. Martingale - false/classic/conservative. False - disabled. Classic - after a loss, enters with a real order of a larger volume as per the specified multiplier. Conservative - after a loss, enters with a virtual order. Then enters with a real order of a larger volume as per the specified multiplier. Coefficient - martingale multiplier. Disabled if 1. %Profit for closing deals (0: not use) - profit as % of equity. 0 - disabled. %Loss to closing deals (0: not use) - stop loss as % of equity. 0 - disabled. %Trail start (0: not use) - trailing start after profit equal to % of equity. 0 - disabled. %Trail (0: not use) - distance from the trailing price as % of equity. 0 - disabled. 1.Fixlot , 2.%of equti , 3. %of margin. - menu for choosing risk per trade. Fixlot - fixed lot per trade. %of equity - % per trade, automated lot calculation depending on the stop loss value. % of margin - % per trade depending on the deposit value. Started always with virtual orders - True. False - disabled. Number of virtual orders - if 0, then disabled. Take Profit - in points. Stop loss - in points. Trailing start (0: not use) - in points. Trailing is activated after this value is reached. 0 - disabled. 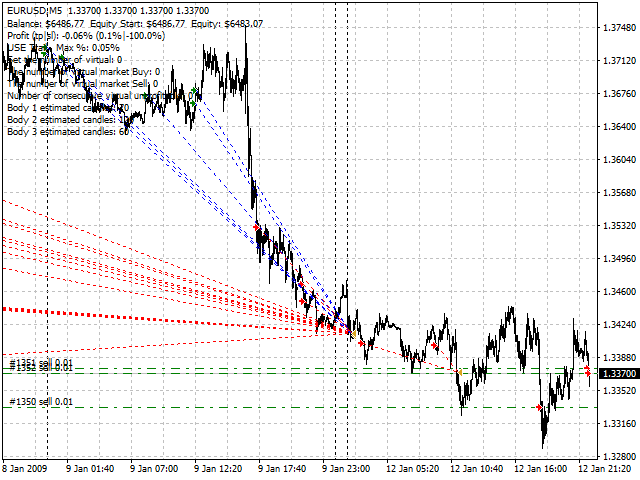 Trailing stop - distance from the price to place trailing stop. Trailing step - trailing step in points. 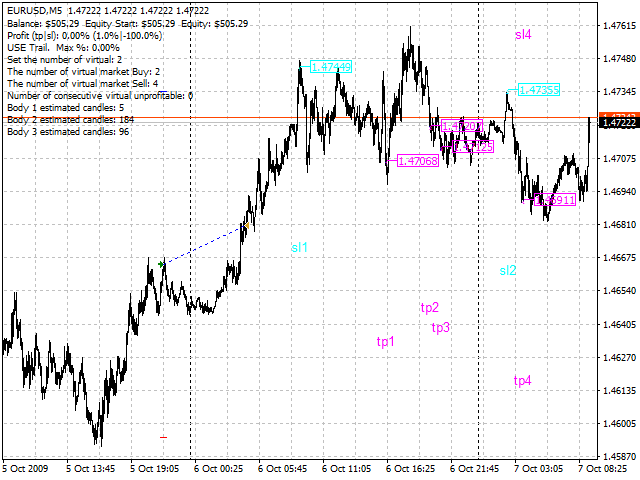 Number orders activations (0: not use) - number of simultaneously open orders to activate a new trailing stop. 0. disabled. 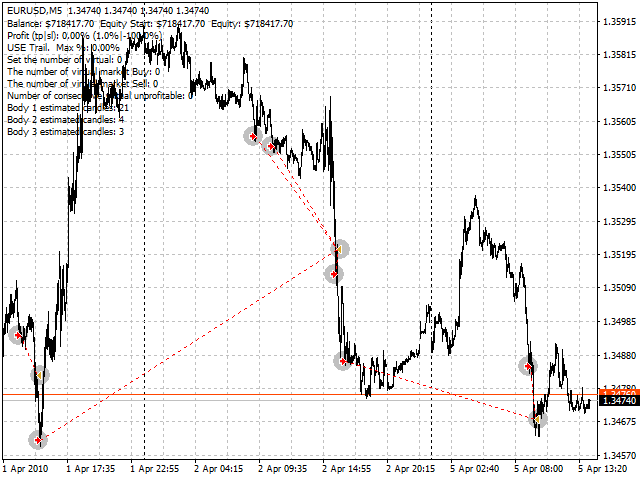 New trailing stop - the distance from the price to place a new trailing stop for all open positions. Finish work Friday - operation end time on Friday. Magic number - ID for orders. Comment strategy - comments will be added to orders. Use this filter - enable/disable RSI filter - sell below 50, buy when opposite. True - enabled. False - disabled. Use this filter - enable/disable MA based filter - sell below MA, buy above it. True - enabled. False - disabled. Period - Moving Average parameter. The shift relative to the chart - Moving Average parameter. MA options - MA type. Used price - closure type. Flag auto cleanup - delete the market entry icons from the chart. Color of orders to buy - color of buy entry icons. Color sell orders - color of sell entry icons.